Original Andover deed conveyed from Richard Sutton to George Abbot ("the emigrant"), written by Simon Bradstreet, March 18, 1663. "The Old Red House", built 1704, stood on site until razed 1862. George Abbot moved from North Parish before 1676 and built a garrison house at the South of the present building. It was between the garrison and 57-59 Central Street that Joseph Abbot was killed by the Indians and his 13 year old brother, Timothy Abbot, captured and kept some months in an Indian village and was later returned by a squaw, to his family. These were George's sons and it is believed the Indians were seeking revenge on Joseph, who had fought at Narragansett Battle. The attack occurred April 8, 1670s. (Fuess, "Andover, Symbol of New England", pg. 70-71). This house was built 1796, presumably by George's grandson (?) of the same name, on the original family homestead. It has been occupied by eight lineal descendents, i.e. 8 generations. Original garrison house stood in rear of house. There have been additions, notably in doorway details i.e. fluted pillars and Greek-style fret worked into the pediment. 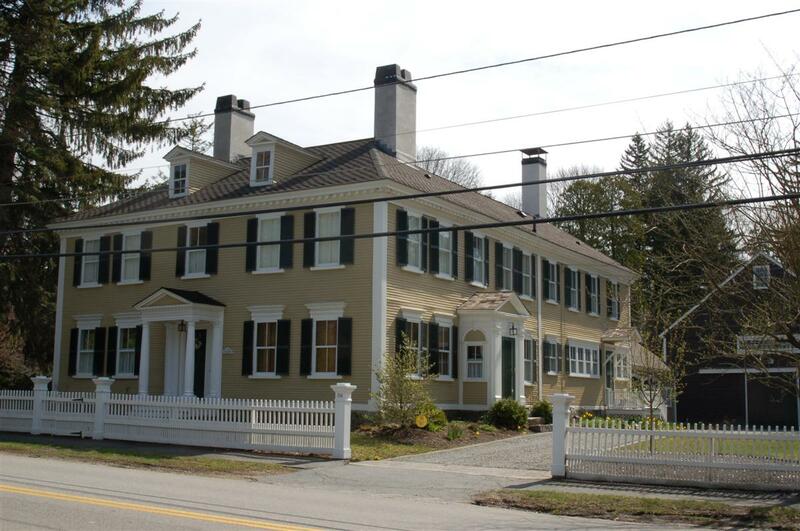 The Captain John Abbot homestead was owned by eleven generations of Abbots, one of Andover's founding families until 1982 when it was purchased by the present owner. This residential complex of house, granary, barn and carriage house represents a graceful vestige of the town's historical development. Central Street is a continuously used thoroughfare for over 300 years. In 1946, this house was owned by John Radford Abbott and George E. Abbot, son of George E. Abbott and in 1968, Mrs. George E. Abbot. *Abbot, Rev. Abiel and Rev. Ephraim: "Genealogical Register of the Descendents of George Abbot of Andover", Boston, 1847.